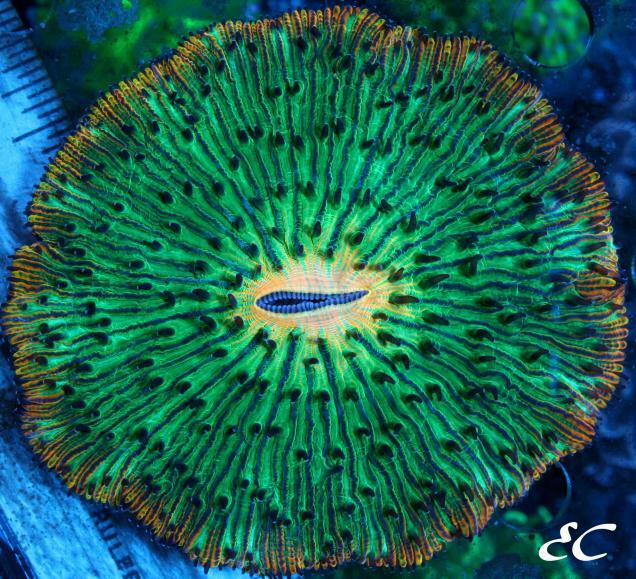 We’re not exactly the biggest fans of green corals, but for this amazing plate coral we could certain make an exception. 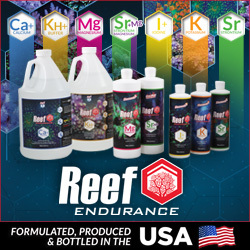 Right around a week ago, the Puerto Rico-based coral retailer Efrain Corals showed off their amazing Nightmare Plate Coral that sports a deep green hue with a vibrant rainbow colored rim and blue stripes. The mouth, which appears to be smiling back at you, is glowing neon yellow and contrasts sharply with the green backdrop. An official size hasn’t been listed for this coral, but using the ruler under the coral for reference, the coral is mostly likely pushing 2.5″ across. The retail price on this amazing plate coral is set at $450 shipped to your door, though that price appears to be somewhat negotiable. And ever though the Nightmare Plate coral is listed as a Fungia, it is most likely a species from the Cycloseris genus. Beautiful animal indeed. Just wow.